Rosa rugosa (Rugosa Rose, Japanese Rose, or Ramanas Rose) is a species of rose native to eastern Asia, in northeastern China, Japan, Korea and southeastern Siberia, where it grows on the coast, often on sand dunes. The Japanese name is (hamanasu), meaning 'shore pear'. 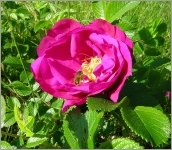 This Rosa has perfect flowers, 2 1/2 to 3 1/2' across, borne solitary or in clusters. Looking like clusters of ripe cherry tomatoes, the orange to red rose hips are oval and glossy, lasting until late autumn. The hips are large, 2–3 cm diameter, and often shorter than their diameter, not elongated like most other rose hips; in late summer and early autumn the plants often bear fruit and flowers at the same time. The bloom will continue sporadically until frost. 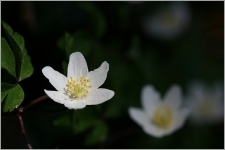 The sweet summer fragrance makes it especially nice near windows or walkways, although it needs to be given space so that the thorny stalks don't grow into passageways. The leaves are 8–15 cm long, most often with 7 leaflets, each 3–4 cm long, with a distinctly corrugated (rough, hence the species' name) surface. The clean, beautifully deep green foliage of this rose distinguishes it from most others. Fall color varies widely among members of this species, ranging from yellow to bronze or an excellent orange-red. It is a suckering shrub which develops new plants from the roots and forms dense thickets 1–1.50 m tall with stems densely covered in numerous short, straight thorns 3-10 mm long. The stems are incredibly spiny, densely covered in short, gray, needle-like thorns about 1/4 to 1/2' long.